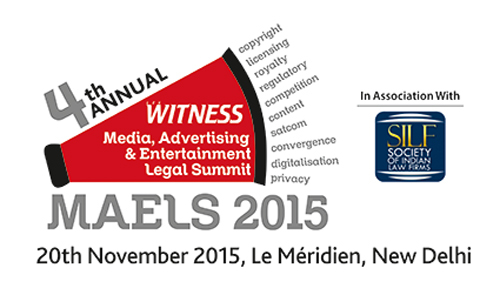 Lex Witness is proud to announce the 4th edition of the Annual Media, Entertainment & Advertising Legal Summit. While the numbers aforesaid might seem to be very promising and aggressive, there still remains a plethora of grey areas in terms of legal and regulatory aspects that the Indian Media & Entertainment Sector struggles to get through. The concerns vary from favourable business environs to the morals and ethics of journalism as well. The sector swings at a double edged sword where the business extremes are struggling hard to strike a balance between various notions of business. It is under this background the Lex Witness has researched over 3 months of time and has been able to curate a yet another edition. The Indian Media & Entertainment Sector has been through quite a few strides in all manners but, Copyright remains a major cross road for the Industry to cross over. It is still a word of imagination when it comes to strike a balance between implementation and vision behind the Copyright Amendment Act, 2012. Right from the sector stakeholders to the Government there are several blocks of confusion and ambiguity on several aspects. Not only this, but the industry within itself seems to be divided and lacks a unified stand. Regulation in the M & E Sector has often raised eyebrows to ponder whether the business environs are friendly or not. The Industry as a collaborative one in nature, has been struggling through to find its way out of the regulation mazes. With TRAI on one hand and CCI on the other there are several realms of debates and discussions today to see how best one can adhere to the law and take up the business fortunes as well. No doubt the watch is quite stern and clear! The Indian Media & Entertainment Sector stands at a razor's edge when it comes to self-regulation, ethics, freedom of speech and expression and media rights. This is one such locus where all policies and efforts come at a pause and seek a direction which is permanent, well consented with and appreciated in terms of business environs. Digital India - Easier Said Than Done? The current government machinery has the NAMO way towards shining India towards a Digital Makeover. However, there is much more to it. The Satellite Communication scenario in the country has been shelved for long beginning 1997 - 2012 and yet no relief has been announced as the New Satcom Policy, 2015 is long awaited by the Industry overall. While the draft 'seems' to be quite relieving and encouraging, until then, what has the industry been going through? Amongst many other sectors of India Inc, the Media and Entertainment Sector stands with a pomp as well, when it comes to the tremendous uplift that has come in due to 'Technology'. The era no more remains of media being about the Newspaper or the Television. It has stretched its arms towards a world of Internet which drives domains like Online and Digital Media Worlds. These worlds seem to be parallel media worlds via apps, websites and various other platforms. However, with the platforms crossing a galore mark, has also led to a wild hunt and dissemination of content that has not only created Copyright Complications of different sort but has raised questions of piracy and ownership as well.